Our hats are off to these young men and each and every veteran who has served our country during the world struggle for freedom. The photo below whet my curiosity as to how the soldiers from Tunkhannock and the surrounding areas fared during World War I. Thus, I began to do some researching and I know it does not cover all the soldiers, but I wanted to begin “The List of Remembrances” of those who served, some of whom gave their all to keep America Free and Strong. I hope those of you who have ancestors or whose research has provided additional names will add them to this list as we honor and remember the soldiers of Tunkhannock and surrounding areas who fought and died for freedom during World War I.
I’ll begin the list with DENNIS STRONG , the first WWI soldier from Tunkhannock to lose his life during this war and in honor of whom the Dennis Strong American Legion Post #457 in Tunkhannock was so named. 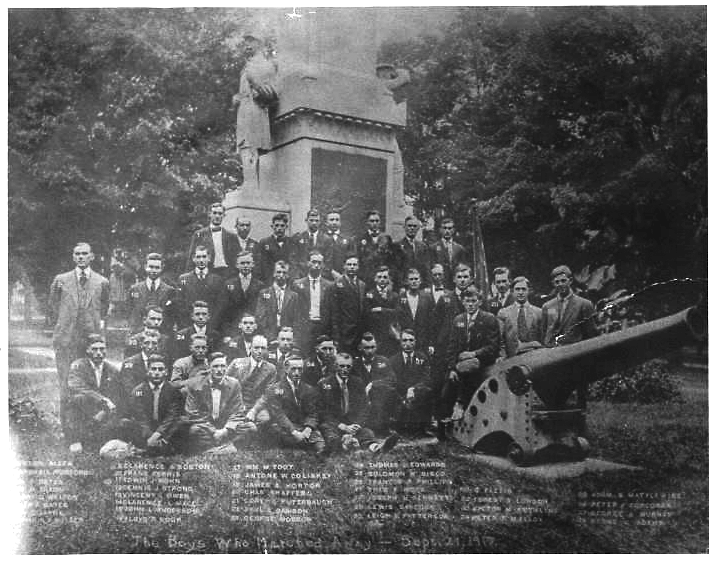 This picture can also be seen at the Wyoming County Historical Society’s Museum which would be worth your while to visit, to enable you to see each individual in the photo more closely. This is Private DENNIS JOSEPH STRONG, for whom the Dennis J. Strong American Legion Post #457 in Tunkhannock is named. 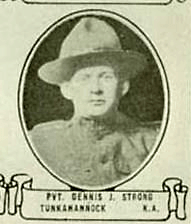 Dennis was born on 23 July 1895 in Laceyville, the son of Christopher William Strong and Margaret Ellen Brady Strong. 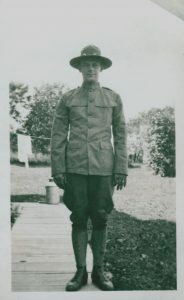 In 1917 he and his family were residing at 22 Second Street, Tunkhannock when he was drafted into the Army. At that time he was working as a locomotive fireman for the Lehigh Valley Railroad, was single and just 22 years of age. He had a brother, James R. Strong, and sisters, Anna Bertha and Mary G. Strong. He served in Co H. 79th Division, 110th Regiment Pennsylvania Volunteer Infantry when he was killed in action. There is a Veteran’s Burial Card that indicates he is buried in the western section of the Overfield Cemetery in Meshoppen, PA. Following his death his parents and siblings continued to reside in Tunkhannock and lived at 3 E. Harrison Street in the 1920 Census. His father was a foreman on the Lehigh Valley Railroad. On August 20, 1918, PRIVATE DENNIS JOSEPH STRONG gave his ALL in the service of his country – no greater gift can a man give than to lay down his life for his country. May his name long be remembered and thought of when we hear mention of the DENNIS J. 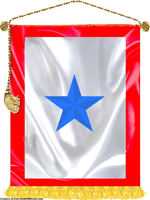 STRONG AMERICAN LEGION POST #427 of Tunkhannock, PA.
LT. DELMAR HERBERT STOCKER – Died from Accident and Other Causes. Served in the Army from 12 Sep 1917 to his death on 3 Oct 1919. He was with the Dental Reserve Corps, 309th Engineers, 5th Battalion, Pennsylvania. There is a memorial headstone for him in Sunnyside Cemetery (south side, section 985), but he is actually buried in the American Cemetery in France. 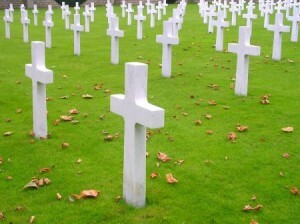 Marble headstones at the US Military Cemetery, Bony, Somme, France. Pvt. Leon CHAMPULVIER, of Skinners Eddy, – died on 26 Sep 1918 according to the Honor Roll published in the Oregonian newspaper. Pvt. Irving T. MOSS, Tunkhannock – died on 20 July 1918 from battle wounds and lies in the Aisne-Marne American Cemetery, Belleau, France, Plot B, Row 9, Grave 56. Lieutenant Raymond Townsend TURN’s obituary from the 02 Sep 1921 Wilkes-Barre Times newspaper noted that his funeral was held at the home of his aunt, Mrs. Stanley HARDING at Tunkhannock and was very largely attended. Lieutenant TURN was a nephew of the late Dr. Park SICKLER, and his father, John TURN, was president of the Aetna Life Insurance Company of New York. Interment was in Sunnyside Cemetery. Horace ASHELD lived at 105 Tioga St, Tunkhannock at the time he enlisted in the Navy on March 20, 1918. Horace ASHELD continued to live in the family home on what is today designated 105 West Tioga Street until his death in October of 1985 at the age of 89. Mr. Asheld never married. Edmund C. YOUNG, a First Lieutenant, Inf-ORC. Commanding office of register and recorder of Tunkhannock. Clifford George PICKETT (photo, right) of Laceyville served in an Army RR Det, 19th Engineers in France during WWI [Submitted by James Black]. Whose name and story can you add to this loyal and patriotic group of young men who deserve to be remembered for their unselfish service to their country during World War I? Clifford George Pickett of Laceyville served in an Army RR Det, 19th Engineers in France during WWI see picture at link of him in Uniform. His WWI Uniform and several German (Helmet and Belt buckle) items have previously been donated to the WCHS museum in 2015.